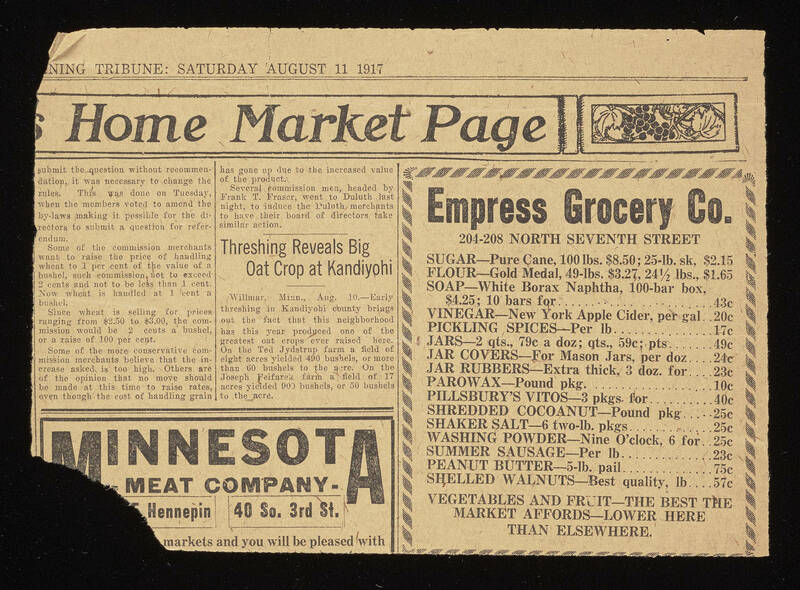 SATURDAY AUGUST 11 1917 Home Market Page submit the question without recommendation, it was necessary to change the rules. This was done on Tuesday, when the members voted to amend the by-laws making it possible for the directors to submit a question for referendum. Some of the commission merchants want to raise the price of handling wheat to 1 per cent of the value of a bushel, such commission not to exceed 2 cents and not to be less than 1 cent. Now wheat is handled at 1 cent a bushel. Since wheat is selling for prices ranging from $2.50 to $3.00, the commission would be 2 cents a bushel, or a raise of 100 per cent. Some of the more conservative commission merchants believe that the increase asked is too high. Others are of the opinion that no move should be made at his time to raise rates, even though the cost of handling grain has gone up due to the increased value of the product. Several commission men, headed by Frank T. Fraser, went to Duluth last night, to induce the Duluth merchants to have their board of directors take a similar section. Threshing Reveals Big Oat Cop at Kandiyohi Willmar, Minn., Aug. 10. - Early threshing in Kandiyobi county brings out the fact that this neighborhood has this year produced one of the greatest oat crops ever raised here. On the Ted Jydstrup farm a field of eight neres yielded 400 bushels, or more than 60 bushels to the acre. On the Joseph Faifarex farm a field of 17 acres yielded 900 bushels, or 50 bushels to the acre. Empress Grocery Co. 204-208 NORTH SEVENTH STREET SUGAR - Pure Cane, 100 lbs. %8.50; 25-lb, sk, $2.15 FLOUR - Gold Medal, 49-lbs. $3.27, 24 1/2 lbs., $1.65 SOAP - White Borax Naphtha, 100-bar box, %4.25; 10 bars for 43c VINEGAR - New York Apple Cider, per gal 20c PICKLING SPICES - Per lb 17c JARS - 2 qts., 79c a doz; qts., 59c; pts 49c JAR COVERS - For Mason Jars, per doz 44c JAR RUBBERS - Extra thick, 3 doz. for 23c PAROWAX - Pound pkg. 10c PILLSBURY'S VITOS - 3 pkgs. for 40c SHREDDED COCONUT - Pound pkg 35c SHAKER SALT - 6 two-lb. pkgs 25c WASHING POWDER - Nine O'clock, 6 for 25c SUMMER SAUSAGE - Per lb 23c PEANUT BUTTER - 5-lb. pail 75c SHELLED WALNUTS - Best quality, lb 57c VEGETABLES AND FRUIT - THE BEST THE MARKET AFFORDS - LOWER HERE THAN ELSEWHERE.